View, print, and download the article. Annis, Mary, “Joseph Henry Bodwell Becomes First County Agent in Piscataquis County” (2017). Cooperative Extension – Agriculture. 14. Saturday, September 6 Valley Grange hosts the UMaine Extension Piscataquis County Annual Supper and Meeting and it looks like there’s going to be something for everyone! The program parts include lots of exciting things! Prior to and during supper there will be Extension exhibits and demonstrations including a working bee hive and information on gardening, farming and nutrition. Bring your gardening, farming, nutrition, 4-H questions! There will also be lots of material available… The annual meeting starting at 7 PM will feature highlights of local programming and a feature presentation by John Jemison, UMaine Extension Agronomist, “Think Globally; Eat Locally.” All exhibits, demonstrations, and the program are free! This is collaboration and cooperation at its best! You can come to one thing or you can come to everything! Betty VanDyke continues to be a big supporter of Valley Grange in as many ways as possible. Betty recently celebrated her 9oth Birthday with a party attended by many friends and Grangers. Those couldn’t attend sent cards and messages. This is Betty’s appreciation and some thoughts about her Grange career. 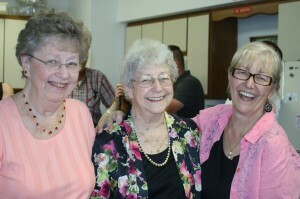 A Happy Betty is flanked by her daughters Lois (left) and Ginny at her 90th birthday celebration. I don’t think anyone will ever know how I feel about the Grange and how badly I felt the day I wrote for a demit that I knew I would never use. Those 28 years were the best years of my life and I miss those days a lot. The work I did being Lecturer of Valley Grange for oh so many years were growing years for me and grow I did using my brain to prepare the programs that I hoped would be satisfactory for the night. Being on the CWA committee where my husband had to bring me to Augusta and “cart women around” was a highlight of my belonging. Then being asked to be Community Service Director of the Maine State Grange, how proud I was for that, receiving a Plaque of Achievement for work well done was over the top. I tell you all this not to brag but to let you how much the Grange meant to me. I was “from away,” you see, and people told me then that I would never be accepted. But I tell you here and now I have been accepted and you can be too. The friends I have made through this journey are precious to me because they don’t forget. I have seen this recently on the occasion of my 90th birthday with the cards and Facebook messages from Grangers near and far. I do hope with all my heart that Valley Grange grows with the community as I try to help out in whatever manner I can. If you are from away, please don’t try to change these good people, they have a lot to offer to you and you will be happier if you listen to them. Join what ever Grange is closest to you. Join to help them, your community and yourself. And as the Girl Scouts sing, “Make new friends, keep the old, one is silver the other is gold.” As a member of the Grange you can accomplish a lot. Best of luck to all Granges everywhere. Dover Foxcroft — While it might be difficult to think about gardening and farming in mid-January, a group of volunteers are doing just that. They are meeting at Piscataquis Soil and Water Conservation District office on Thursday, January 30 at 1 PM to begin preparing a third year for the GrowME program. The program is offered to K-3 teachers and schools in Piscataquis County and the surrounding areas. The program is organized by a collaboration between Valley Grange of Guilford, PCSWCD (Piscataquis County Soil and Water Conservation District) and UMaine Piscataquis County Extension. Walter Boomsma, program director for Valley Grange agrees. For a number years he’s visited second graders at PCES to make butter as part of Valley Grange’s commitment to being a resource. “We have fun and the kids almost don’t realize they are learning–some have even asked for instructions and then made butter at home as a family activity.” Grange members have also done seed planting activities and created animal graphs. “We also spend some time just talking with the kids—many have chickens and gardens and it’s fun to share experiences.” Bonstedt has also seen positive impact of these hands on experiences—during last year’s activities she was invited back to one classroom to talk about her native country, Paraguay. GrowME volunteers visit for about 20 minutes and work with students on a simple, grade appropriate activity. Teachers and administrators who are interested need only furnish contact information: teacher’s name-email address and grade. Interested teachers may email grange@boomsmaonline.com or call Boomsma at 343-1842. An online sign-up form is also available at http://growmehelp.wordpress.com. Karen’s Kolumn is written by Karen Dolley, R.N. and Grange Friend… we appreciate her knowledge and her willingness to share! This month’s column is written by Walter Boomsma as Karen is very busy with her work! Farm to school is broadly defined as any program that connects schools (K-12) and local farms with the objectives of serving healthy meals in school cafeterias, improving student nutrition, providing agriculture, health and nutrition education opportunities, and supporting local and regional farmers. Farm to school programs exist in all 50 states, but since farm to school is a grassroots movement, programs are as diverse as the communities that build them. In fact, the collaboration “GrowME” might qualify as we attempt to create agricultural literacy with classroom activities. I’m willing to bet it’s not a coincidence that this is the month when many families make trips to pumpkin patches and apple orchards. Fall is a great time to think about the role farming plays in our health and in our communities. In the broadest sense, the harvest season starts with county fairs and may not end until spring when we open the last jar of veggies canned from our garden. Chances are there are some activities taking place in your child’s school that fall under the “farm to school” heading. But it’s also a good time of year to consider the concept of “farm to family.” An outing to select pumpkins for the traditional jack-o-lanterns can be a healthy family event because it includes fresh air, sunshine, and an opportunity for the family to simply “be together.” These opportunities become increasingly important as the societal trends pull us in different directions or have us sitting silently together while we stare at our cell phones and tablets. Visit a farm market–not only for the fresh produce but also for a chance to talk with the people who have grown what you’re purchasing. Most of these folks are happy to share information–some are very entertaining–and you’ll often get recipes and suggestions for preparation. Most dictionaries define harvesting as the gathering of crops and, with a little creative thinking, we can find much to harvest. When we rake the leaves in our yards, we might be harvesting–as long as we are putting those leaves to some good use–perhaps as compost. (Personally I think a big pile for jumping in would qualify.) Rainwater collection systems allow us to “harvest” rainwater–not something we’d traditionally think of as a crop, certainly. Saturday, September 7 Valley Grange hosts the UMaine Extension Piscataquis County Annual Supper and Meeting and it looks like there’s going to be something for everyone! The program parts include lots of exciting things! Prior to and during supper there will be Extension exhibits and demonstrations including a working bee hive and opportunity for the kids to make “bee hummers,” information on gardening, farming and nutrition. Bring your gardening, farming, nutrition, 4-H questions! There will also be lots of material available… The annual meeting starting at 7 PM will feature highlights of local programming and a feature presentation by Dr. Lois Stack, UMaine Extension Ornamental Horticulture Specialist, “Native Plants in the Home Landscape.” All exhibits, demonstrations, and the program are free! 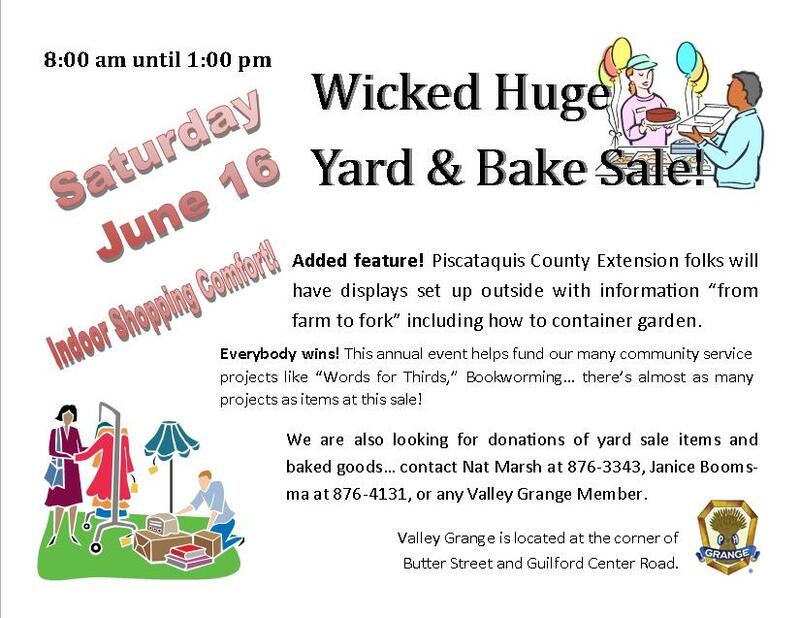 Wicked Huge Yard and Bake Sale!